‘…there is a profound richness that happens when we come together and take the time to learn from each other’s perspectives—the diversity of our upbringing, the color of our skin and the things we are drawn to. If you can work through the differences you enter into a world of richness that is unparalleled. It’s helped me recognize that someone is not wrong just because they don’t think the same way I do. Our life experiences cause scars. Getting to know each other helps heal and soften some of those scars and makes us more receptive to each other…’ TobyMac needs no introduction. I mean, seriously, I’m sure everyone has heard about this poignant, powerful, prolific and poignant singer/songwriter that was once part of Christian music’s most influential bands to ever be in existence. When DC Talk went on hiatus back in the early 2000s, everyone in the Christian community were distraught. While Kevin and Michael both went the solo route (Kevin is still solo after a stint with Audio Adrenaline, Michael has now joined the Newsboys), Toby formed a new band called Diverse City, changed his stage name to TobyMac, and released several successful albums. Now around 15 years and 6 studio albums later, Toby is at it again, at a ripe young age of 50! 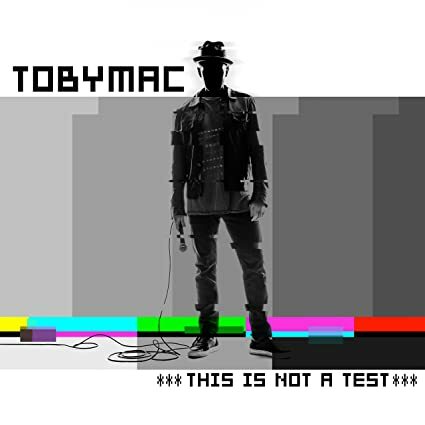 *THIS IS NOT A TEST* is perhaps one of Toby’s most lyrically, sonically and musically mature out of anything he has ever released thus far. With a fair amount of collaborations on the album (from Capital Kings and NF, to newcomer Hollyn and his son Tru), those who have heard the lead single “Beyond Me” are sure to be amazed at how much more impactful and energetic the rest of the album is, and those who haven’t heard any snippet at all from the album…well let me just say you’re in for a treat. Arguably one of the most enjoyable albums I’ve heard throughout all of 2015 (alongside other albums from artists like Lauren Daigle, NF, Third Day, Josh Wilson and Fireflight), this is a must for anyone who is a TobyMac fan, fan of CCM during the 1990s, or just a fan of something different compared to anything Toby has written, recorded and performed in years past. With Toby presenting to us diversity in not only this album but in albums gone past, it is always unique to hear one of Christian music’s pioneers still have some tricks up his sleeve, as we hear the radio friendly “Beyond Me” clock in at just over 3 minutes, with an acoustic guitar and Toby’s soulful vocals grounding a song that reminds us all that what we have to admit often on a daily basis- that we don’t have it all together, and that is ok.
As Toby himself has said in relation to the message behind the song, ‘…I’m learning like never before that I have to be brave enough to look in the mirror and say “God, I don’t have this. I’m in over my head. I desperately need you. So take me to a place where I know I need you because that’s when I’m at my best…’ While not necessarily as catchy as singles like “Made To Love”, “City On Our Knees” or even to some extent “Me Without You”, what “Beyond Me” has delivered is lyrical proficiency and an emotion that reminds us all that sometimes our circumstances and their outcomes are out of our hands, and that’s OK. Soul Glow Activator, a DJ, contributed a remix of the song “Beyond Me”, and while I do prefer the original, this unique version of the song shows us that a song can be transformed and sound different, yet have its heard and emotion still intact. Upcoming rapper (and quite possibly the next Lecrae or even the Christian version of Eminem) NF bolsters the quality of “Til the Day I Die”, a song that offers us comfort in that what we do as a career goes beyond the dollars and speaks to the heart of our motivations- that why we do what we do should be to lift the name of Christ and to share and tell of the love given to us. NF confronts in the poetic words, that ‘…God is not a crutch, you can’t use Him when you wanna, you only look to heaven when you goin’ through some drama, and when they goin’ through some problems and that’s the only time they call Him, I guess I don’t understand that life…’, which further asserts my enjoyment of not only this song but the rest of the album as well. Former Diverse City band member Mr Talkbox and his beat-boxing skills join Toby on “Feel It”, a song paying homage to jazz and 1980s swing music as we see a different side of Toby, a side that reminds us all of how that in everyday moments, we can feel the Lord’s presence as we move to His direction and calling. The hauntingly beautiful and eerily comforting words of how ‘…You take our brokenness and make us beautiful…’ is enough to make “Feel It” a favourite of mine, even if the musical style within the 4:44 song length isn’t necessarily my favourite (I do prefer me a more refined CCM style as opposed to something outside of the box). Nevertheless, Toby’s ingenuity on “Feel It” and many others cannot be denied. “Move (Keep Walkin’)” is a gospel-flavour melody that is by far one of the most out-there musically themed track TobyMac has ever produced. Complete with a gospel choir, we are encouraged to ‘…keep walking, soldier keep moving on…until the morning comes…’, and that as long as we keep our sight and focus on Christ as we live each day til the best of our ability, we can testify that our efforts aren’t in vain as how we live and what we do has an impact on ourselves and those around us. And while “Light Shine Bright”, featuring newcomer Hollyn, hardly gets off the ground musically, this subdued duet is as worshipful as ever, as Toby sings from the outset of how he ‘…wants to magnify Your light, I wanna reflect the sun…’ In a similar theme to songs like Britt Nicole’s “Glow”, Newsboys’ “Shine” or Natalie Grant’s “Burn Bright”, Toby and Hollyn deliver stellar performances in what is a duet that reminds us all that to be relevant doesn’t reflect upon age (TobyMac is more than 50, not sure how old Hollyn is but I’m assuming pretty young), and that even as we are older like Toby, we can still be current, relevant, and still encourage and inspire people around us. Both the remix and the original version of “Like a Match” seemingly pale thematically in comparison to the rest of the record, yet still delivers musically as Toby offers electronics, glockenspiels and a looping drum beat to present the theme of us showing our love for Christ as we unveil who we really are, knowing full well that our friends will only respond to Christ if we ourselves are serious too. “Fall” brings down the tempo a bit as Toby sings a love song to his wife Amanda, while “Lift You Up”, featuring Gotee Records artist Ryan Stevenson, is a celebration of how God continues to lift us up and help us, even during the moments where we may say we don’t even need it. While a times both Toby and Ryan’s vocals can seem too similar in this track, “Lift You Up” is a nice change in pace compared to faster melodies like “Til the Day I Die” or the title track. Worship and gospel collide together with pop as Toby places on his Matthew West/Michael W. Smith hat as both “Undeniable” and “Love Broke Thru” each embody the worship that is in every CCM artist, even Toby, where these two aforementioned melodies may be the only hint of a worship track he has recorded throughout his career so far. With a looping percussion beat, and gospel gang vocals, you could almost mistake Michael W. Smith for singing “Love Broke Thru”, which isn’t necessarily a bad thing. As we realise that when ‘…love broke thru, You found me in the darkness, wandering through the desert…’, we are encouraged to be the love that breaks through the lives of people we meet, just like how God broke through for us in the times we needed Him the most. Then there’s “Love Feels Like”. Yes, the awaited DC Talk reunion is here. A mere 15 years later, Toby, Kevin and Michael have collaborated together, and they sound as great as ever- with Michael’s sturdy vocals combined with the hauntingly refreshing vocal moments of Kevin coupled with the screaming of Toby in just the right spots, all three creating a song that reminds us timely about what it means to love, and what it feels like, to ourselves and others, to love and be loved. As Toby says himself, ‘…Love Feels Like has a deeper meaning for me personally. I didn’t try to write a song about how love can be beautiful, hard and fulfilling, but it just poured out of me…’ Real love requires a lot of work, and is not always the easiest emotion to express. It is when our comfort zone is shattered and we are called to walk against the norm that we can realise and understand what the lyric line in the song of how ‘…empty never felt so full…’ really means. We may feel emotionally drained and empty, yet with the goal of showing love to others, we can still feel the fullness, of God and Christ, and of the appreciation we know others will bestow upon us because of us choosing to show love unconditionally, hence the dichotomous ‘full’ and ‘empty’ words both in the same lyric. As both Kevin and Michael enhance the song and the album 10 or even 100 fold, *THIS IS NOT A TEST*’s highlight, if ever there was one, is in fact “Love Feels Like”. If you only have money to download one track from this album, the collaboration with DC Talk will be it! ‘…I want them to walk away saying “I feel good. I feel like I can love my spouse well. I can love my friends. I feel like I’m even open to having a conversation about who God is. I want them to know love is worth everything you put in. If that happens, then I’ve done what I wanted to do…’ At a ripe young age of 50, Toby has no intention of slowing down, as this new album stands tall both objectively and subjectively. One of my favourite albums of Toby’s ever (alongside Tonight and Portable Sounds); it is Toby’s eclectic and comprehensive range of musical genres and styles that further enhance my love for *THIS IS NOT A TEST*. With a whole bunch of collaborations; this is a perfect gift for anyone who is a TobyMac fan, or even a fan of music in general. From pop, to worship, to rock, rap and hip hop; Toby’s latest has something for everyone, as this standout in August 2015 is sure to give him a nomination of sorts in 2016? Well done Toby for such an enjoyable album, and one that is a reminder that age is just a number, and that if your passion is for the Lord, it rarely matters how much longer you reckon artists like Michael W. Smith, Steven Curtis Chapman or Amy Grant will be on the road for.